People nowadays have a very good chance of using microphones, but not many people really make good use of microphones. The so-called "good" is nothing more than a good pickup, long life and harmless to health. Here are some of the big mistakes I often see and are taboo we use. As the microphone part of the pickup more sophisticated, and the parts are very delicate, beat the microphone or blow to the microphone can easily cause damage or parts shift, the final impact on sound quality. Microphone pickup the best distance of about 10 cm. Some "leadership" speech is far away from the microphone, and some singers close to the microphone, resulting in excessive pickup sound too small, then push the volume fader up to easily lead to howling; too close to the speech Sound of air also picked up, issued a "puff puff" of the noise. 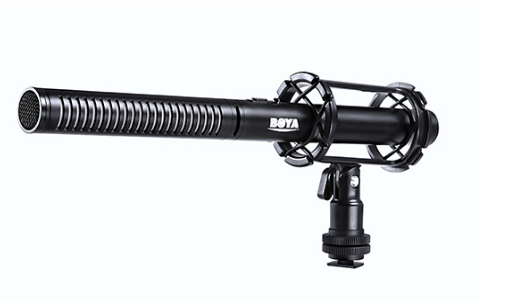 The BOYA BY-PVM1000 Professional Shotgun Microphone features a Line + Gradient pick up with the length of 27.8mm, features directional characteristics. The BY-PVM1000's high directivity, low noise and transparent audio reproduction make it a well suited microphone for Direct-coupled, balanced output ensures a clean signal even in high-output conditions Transformerless design for improved pickup of transients Switchable 80Hz high-pass filter. Avoid pulling the microphone lead when submitting the microphone. As the microphone has a certain weight, often pull the lead, it is easy to cause the lead off, the plug is not in good contact, resulting in pickup failure. Turn off the microphone switch at a meeting or after singing, when the sound controller does not turn off the mixer volume fader in time: on the one hand, it picks up the other noise and on the other hand, The necessary speech was broadcast. There was one such experience by President Bush, causing embarrassment. Some people use, do not pay attention or the pursuit of a near talk effect. Mouth often stick to the microphone, not knowing that this not only undermined the normal frequency response of the microphone, also caused a great health hazard, microphone network cover a lot of germs.